It was a fantastic summer. Parents visited for almost a month, and I took them to the coldest place in France I could find, Bretagne (such was their wish). The next weekend we spent discovering Brussels and Bruges, a small city in Belgium that was on my travel map for a long time. Mom and Dad were happy. The same day I left them at Charles de Gaulle, properly escorted by all the priority lines I have access to, Louveteau and I took off to our own adventure, to St Petersburg and Moscow and then to Athens and Santorini. A few weeks later, we closed the summer in Croatia, in between Dubrovnik, the setting of The Game of Thrones’ King’s Landing, and the island of Lopud. I was breathing sun, summer, salt water and the distinct spirit of adventure. And all this time, in the background, I was working on my happiness project. You might wonder, what’s there to work on during the summer holidays, when everything around inspires happiness. Time economics. I am a big believer of doing things when you can afford doing them versus when you need them to be done and all the alarm systems are on. I knew that when the work fully restarts after summer, it will probably take 90% of my focus and my most ambitious aspiration would be to have some kind of control over it. It is true: with my next week’s schedule looking like Croatia –> Geneva –> Paris –> Prague –> Moscow –> Paris, the time my happiness hacks becomes very limited. Do to-do lists proved to be very helpful. Here is my theory: when we keep a lot of to-do things in mind, it takes our brain’s operational capacity. So we can dedicate less of out brain power to tackling complex tasks, remembering important information and even watching movies in a foreign (or a second foreign) language. It is logical, if you think about it: when you open many simultaneous tasks on your computer (or your phone), its performance goes down. Closing some unnecessary tasks gets the efficiency back. Taking things to-do, especially if you juggle between tasks and projects, off your memory lists, frees up a lot of capacity. I am organizing a lot of work and personal information in One Note. It works great for me, and I love it. That’s where I log the details of the meetings and conference calls, travel tips and itineraries, quotes from my favorite books, Photoshop tips and much more. Now, what I was struggling with is distinguishing things to do in all that I am keeping and prioritizing between them. So I started separate to-do lists on Wunderlist, an all-device app that does exactly that: allows you to keep track of things you need to do, to organize them into lists and to keep track of your progress. You can also share your lists (and things to-do) with others, which I did with Louveteau. It has caused a lot of silly fake action items, but we had fun and managed to accomplish a lot, too. I organized my Wunder lits by my priorities: one for work, papers, financials, travels, and, most inspiring, goals. (I gave them some funky names to keep things from boring and not to feel like I was doing a chore.) Now, here the policy of my company requires to tell that I am working at Microsoft, and both of these products are part of our portfolio. So that it does not seem that I am secretly pitching for them. Well, I am pitching for them openly, and true that, these are our products, even though I was using Wunderlist long time ago before we bought it. Decluttering was painful. It was fun first, when I was throwing away all kinds of documents that I accumulated over the last 1,5 years of my life in France and that I no longer needed (which in France frees up a LOT of space). Apartment bills, bank statements, previous versions of my work contract, you name it. Euphorically trashed. Things got more complicated when I moved to clothes, shoes and bags. I don’t shop that often and usually everything that I buy is of a good quality. My taste does not really depend on the fashion of the moment, all that I buy can be vaguely grouped as classics, so I have some repetitive things of a good quality and end up wearing a limited selection of them. I keep the rest exactly because a) they are of a good quality and b) they don’t go out of fashion. Plus, I am attached to some of them, emotionally. So, in case I don’t need them anymore, like with my old Canon 550D, I like finding them new owners. My 550D, for example, is now a beloved travel and everyday companion of my Moscow friend Catalina. And I am very, very happy about it. The rest of good quality things which don’t go out of fashion (mostly designer shoes and bags) I have parked at home in a big paper bag and plan to sell at a videdressing or boncoin, a French low profile wide-audience site. The real problem with decluttering though is that it quickly becomes a mindset. Once you get into it, you constantly look for (and find!) areas to clean up: laptop desktop, a book shelf, phone pictures, things you routinely do, people you routinely see. Then decluttering becomes a constant to-do, a habit. And it is still a dread but – a satisfying one. Making a plan is perhaps the most important of my resolutions. I believe in importance of structure as much as I believe in good timing, but in case of the structure, this faith of hard won. By design, I am an easily inspired person, and it often gets me carried away by new thoughts, plans, people and events. Structure is something that makes me more productive and helps finish my projects. I know it because I have tried forcing it on myself before and got great results. So now I make some kind of plan for everything that’s important to me and stick with it. I make really detailed plans for work and plans which are more like sketches for hobbies and travels. The trick here is to go down to a comfortable level of detail and not to make plans that would feel like a drag. So obviously, now I needed a plan with my happiness quest. There are different takes on this one. Gretchen Rubin, whose “Happiness Project” I kept on reading for motivation, chooses an area to focus on, and dedicates a month for tackling it. The author of the 90s’ classics “Maximum Achievement” Brian Tracy suggests setting goals (both quantitative and qualitative) for various areas of your life, so that you feel that you are getting closer to your goals all the time (and what’s happiness if not a progress). I have tried the “Maximum Achievement” approach before, so why not doing something new. 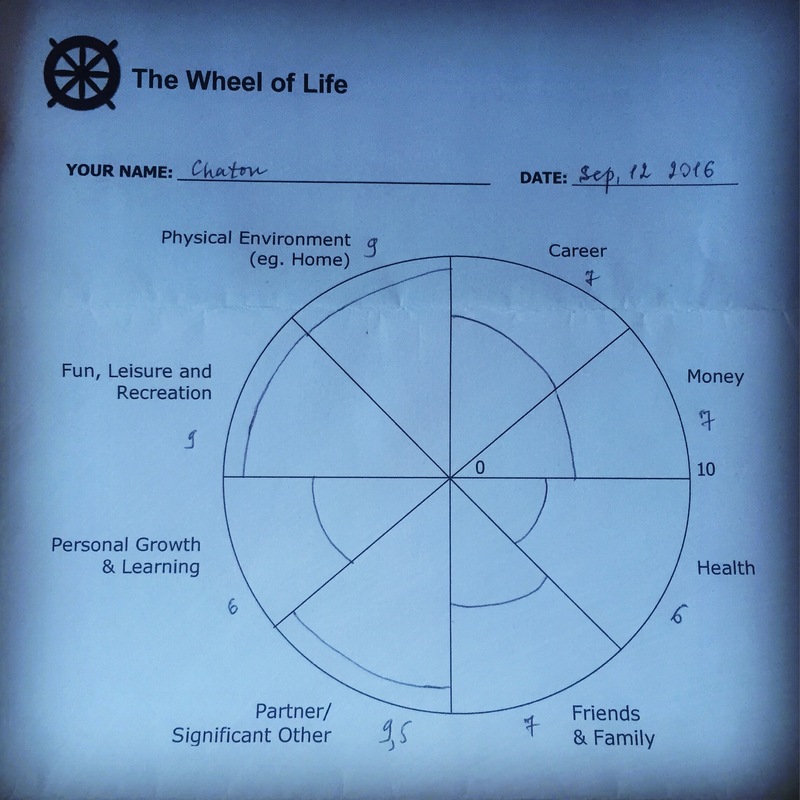 I have dug out the Wheel of Life assessment from the depth of my work e-mail box (you can download it from the link) and finally sat down to do it. That’s what I got. I have dug out the Wheel of Life assessment from the depth of my work e-mail box (you can download it from the link) and finally sat down to do it. That’s what I got. As you can see, the areas in which I have scored the most happiness are hobbies (Fun, Leisure and Recreation), home (Physical Environment) and Significant Other (I have added 0,5 points here because of the peer pressure when making my graphs next to Louveteau. He gave me 9,9 – more as a role modeling, I think). Career, Money and Friends & Family are also good. (Not lastly because I have allocated all the work anxieties to Personal Growth & Learning.) The most sensitive areas then remain Health and Personal Growth & Learning. What’s your experience with planning for happiness? Do you prefer to work on one area of life to improve or to tackle multiple challenges? Have you ever made a Happiness Plan? Or draw your own Wheel of Life? When I was studying, I ve pass a lots of time for reading near-business and near-psycology books:) I was try to find some book even more…. some guide which could help me with my artistic soul. Artistic mess, like we called it in Russia was my 100% credo. It was my proud! I I started to work and quantity of papers increased exponentially. And I ve stood to be proude that I can find everything I need in such mess. In addition I had a problem with timing (but the reasons were diverse from my artistic soul: I was study in a school with too many reglamentation and restriction… where it was better to die than to be late in 1 minute… and I doesn’t joke. So, when I finished this school…. well, you can imagine my freedom and anarchie’s spirit). I was read plein of books, but nothing looked good enought. Or it was too difficult, or too boring, or unreadable.. Until this one. What I like, that it’s a book which was writen by woman (it’s as I undersood is very important cause woman organize not only business life… at the same time you need to organize another aspects of your life). It’s step-by-step guide with tips and little weekly tasks. So I ve learned step-by-step how to reorganaze my way of living, planification and organisation. And the autor is absolutely right, by learning her system you can use this knowledge everywhere… when you make a travel planning or child’s birthday party … or in my case even the Governer daily planning for full 3 days (and almost night) at SPIEF, officials dinners for 800 guests, haha… there is no more impossible for me. PS: many many thanks for soft recomendation!!! You know, it’s really very useful for me! Thanks for the reco! I will check out Organize Now for sure.